You practically Instagram everything you see anyway, so why not alter your vision to feel like you’re on Instagram 24/7? Let’s admit it: Some of you are total Instagram addicts. You can’t seem to take pictures without the need to add filters and make them look cooler, and photos without the edits just seem bland and… oh, so contemporary. If you’re so in love with vintage photographic filters, why not see the world in them? 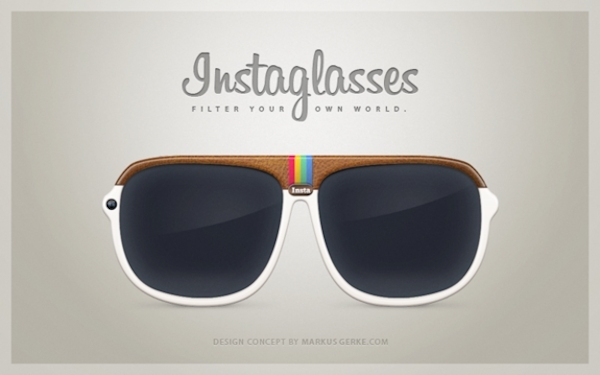 That’s the idea behind the Instaglasses concept by Markus Gerke. Maybe taking it one step too far, the Instaglasses concept contains a 5 megapixel camera at the side of the Ray-Ban-esque frame which will apply filters to everything you see in real life. The original viewpoint of the city too bland for you? Apply the Amaro filter to soften your surrounding. That person sitting across from you on a blind date not attractive enough? Hey, maybe a Brannan filter will help. All the buttons on the Instaglasses are located on the sides so you can switch filters in stealth mode as if you’re just fixing your glasses or hair. We’re not sure where Gerke is aiming to apply an Internet connection on the small frame, but since he doesn’t plan to producing the Instaglasses in real life, we suppose it doesn’t really matter. Without a doubt, it’s a silly and crazy concept but it does prove that Instagram is truly changing the way the modern person views the world and photography. We can only imagine that a day full of filters could really mess up your perception of reality, and likely damage your eyesight. Still, we have no doubt that if something like Instaglasses ever make it to the masses, there will be a slew of fans begging to grab their own. Just remember to take ‘em off in the rain. If you love the Instaglasses concept, be sure to gander at what Instagram would look like if it was a real, physical camera. The two together could be a bit of an overkill, don’t you think?